One of the most coveted Canadians playing junior college is 6-foot-7 Edwin Jeudy. This Thetford Academy product from Montreal, QC has just wrapped up his sophomore season at Gillette Community College in Wyoming. A campaign that saw his Pronghorns finish their season at 27 and 4. An instrumental Jeudy averaged an eye-opening double-double -- 13 points and 10.5 rebounds per game -- significant strides statistically from his freshman season that saw him average 11.2 points and 8.4 rebounds per game. In two seasons under Pronghorns head coach Shawn Neary, Jeudy played a part in 59 victories. However, in last weeks Region IX Tournament quarterfinals, the Pronghorns were upset by Trinidad State ending their season prematurely. Verification came Monday when they were omitted from the National Tournament selection process despite their 27-4 campaign. Junior College is for dogs. If you can return home with a double-double to your name that means you are a junkyard dog. Is Jeudy meaner than a junkyard dog? Canadian Ballers tossed it up with Mr. Double Double last week ahead of his conference tournament. CB: Monster season. Especially on the glass. Anything you have done specifically to improve statistically the way you have? EJ: Well, last summer in 2017 I did a lot of workouts to improve my game, I had a great trainer called “Empire Basketball” he did a great job to keep me in shape over the summer but I improve on so many aspects on my game especially my jump shot. From my freshman year to sophomore year at Gillette, I can tell there a huge difference in my shooting percentage. CB: The stretch this season of six straight double-doubles. What is your secret to corralling so many boards? Is that something you saw your self-doing ahead of the season? EJ: I always knew I could be good on the glass. It’s just a question of mindset and giving all I got on the court. There no secrets pretty much, bring a lot of energy on the court and be hungry for the rebounds. Because of that, it helps my teams a lot. CB: Some say you're a wing. Do you prefer a position? Any players past or present, pro or collegiately you model your game after? EJ: I consider myself a 3 and 4 or just a stretch 4. Because I can do both well. But I would do anything that a coach tells me to do on the court. I could say like our famous Canadian rebounder Tristan Thompson with some touch of Draymond Green. CB: Earlier in your career you were linked as a point guard, is that something you like to demonstrate from the forward position these days? Is a point forward something you could be classified as or are you more of a scorer first? EJ: Well I always wanted to be a point guard since a was a kid but I fall to be a forward because I found out I could be very good in this position. Could say more Point Forward, I love passing the ball to my teammates and also love to make them look good by passing the ball to them. CB: Your another prospect out of Thetford. Since Thetford was in Alma the program has produced some studs. (Chris Boucher, Narcisse Kalamba, Quincy Guerrier) Your kind of the 1997 generation poster boy. What can you share about your experience there? Some of the things you cherished from your time at Thetford? EJ: Being a student-athlete at Thetford Academy was a true blessing for me. I wouldn’t be in this position without the help of great coaches like Coach Igor and Coach Ibrahim. I wasn’t really good at basketball in my first year at Thetford Academy. But they both believed in me and push me to work hard to reach my full potential! And I remember they always telling me I could be a great player just like Chris Boucher. My Dream is to be a professional basketball player and Coach Igor and Coach Ibrahim will always help me on my journey and make sure my dream comes true. Being in Thetford Academy will show you what the meaning of being in a family is. B: How about playing in Gilette the last two seasons. You have won almost 60 games. You have Mohamed a late-blooming Canadian and Lok Lam over there with you. How is the team looking going into the postseason? What do you think the key to making a national title run will be? EJ: I had 2 great seasons at Gillette College. Having a former Thetford teammate Abdul Mohamed was really great to play with. He’s such a great and unselfish player & right now, I think we have a chance to go to Hutch (National Championship) but now we're focused on that Region 9 championship. Abdul and I have a great chemistry together ever since we played together at Thetford. 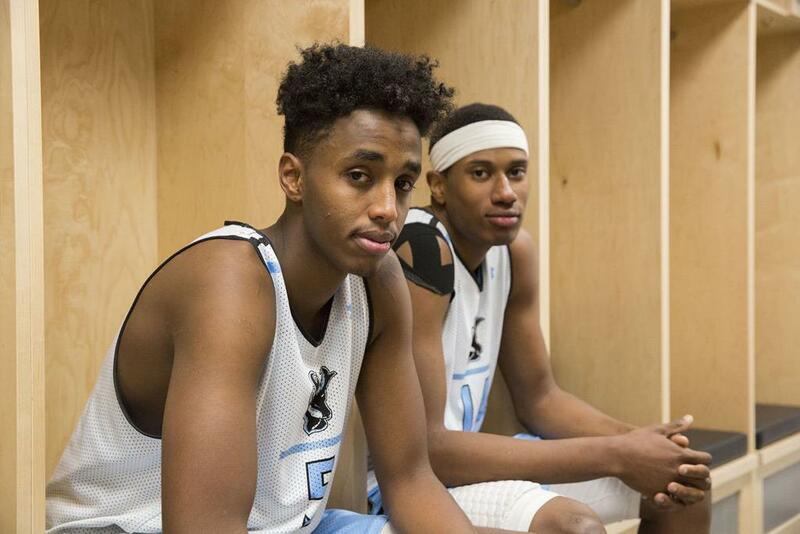 Abdul's easy to play with on the court and get along with off the court. Last year, most of my teammates were the freshman and we ended up in the national tournament. This year we have the same players all back in Gillette and we want to complete the same goals like go to nationals again. CB: Entering the postseason how does your recruitment look like? Any concrete offers and certain programs working the hardest for your signature? EJ: Right now I hold an offer Binghamton, Coppin State and Lamar University. Also have heavy interest from University of Portland, University of South Florida, the University of North Carolina at Wilmington, Stephen F. Austin, Florida Atlantic University and more. The University of South Florida and Lamar are the ones working hardest. But all the schools are equal for me until I do my visits after the season is over. CB: Last but not least anything you covet from the college of your choice? EJ: I’m looking to have a great relationship with the coaching staff and be comfortable. I’m looking also for a school to prepare me to be a professional basketball player. There you have it. Straight from the 6-foot-7, 220 pounds Jeudy himself. A Haitian born prospect who was raised in Montreal, QC. Thanks to Jeudy for allowing us to share his story, definitely one of those treasures playing Juco with Canadian ties you and your staff should keep tabs on through the month of March in preparation for next fall. Edison Jeudy!